A little idea/tip for the day. Was having my lunchtime juice and ended up, as you do, polishing off the juice box. Keen to get the most from this, I walloped the top and swirled and stuff, but some still remained inside. So I yanked the top off. 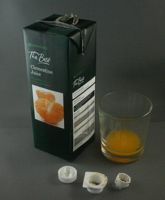 This gives you some interesting componentry, from a multi-piece cap pourer to the box. All present reuse promise, but here I look at 'waste'. Because that cap arrangement intrudes down a wee bit, at least 2mm, into the box body. Yank the whole deal out (and keep it... you never know) and you get a fair bit more juice out (see pix). Heck, you may also even make the folk at the recyclers a bit happier at one less contaminant in the recycling waste stream to address. Good job it has been a horrible weekend's weather. Because 'working', indoors, over a nice weekend does not float my boat. And that was, indeed my main task Friday, Saturday and Sunday at the Cheltenham Design Festival. Now in sharing my thoughts here (heads up, it was a long set, so the screed is too), I should stress they are not based on the totality of the event, which was eclectic, covering anything from the philosophical to the educational to the down and gloriously dirty. Though actually very reasonably-priced at £30, the all day tickets were not really in my budget range, given where my professional interests lie (personally, jet planes and race cars were also right up there, but a price too far). I restricted myself to those which, as billed, seemed to offer most promise to my Junkk/RE:tie endeavours, with one extra for the 'ad man' in me (of which more, in a sad way) later. Friday I chose two, frustratingly at either end of the day, as the venue (while very nice) had little to occupy one outside the seminars. First up was 'Colossal Issues, Simple Solutions', with Simon Kavanagh of KaosPilot. I was seduced by the blurb, which inferred 'saving the world'. There were a few elements but it was more on design education and, whilst interesting, really not too helpful for me. For the large student contingent, maybe, as at least he seemed to appreciate the role of earning a living whilst designing. One thing he did do, which was good, was take time out to get the audience to write out a project we had not yet moved on with, and then turn to explain it to the person next to you, with reasons why not and how that will change. It was effective and good fun. Sadly, bar one pulled out to share, this was not amplified upon. Mine, for posterity was: "To create a range of consumer packaging that can be reused to solve the problems of the potable water collection and storage in 3rd world environments with no or poor systems to do so". On a back burner, but bubbling still. In the evening was a Q&A on the them of 'Is There A Future For Design? ', which was meant to feature Sir John Sorrell but he was ill so covered by Chairman Stephen Marston, Chancellor of UoGloucs. Interesting chap bearing in mind my current efforts on talent/business matchmaking as his career as a CivSev also embraced time with the Department of Business, Innovation and Skills, on top of overseeing educating creative talent to integrate into the workforce. 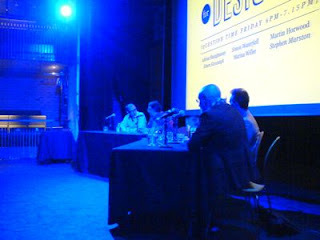 Steven Kavanagh was also on the panel, along with two 'seen it, done it' cynical old, bearded blokes (probably younger than me), the local MP and a woman from the outfit who, I think, designed the Olympics logo. Can't see she inspired much later on, either. For a Q&A session not many got asked and few, IMO, answered very sensibly. There had been a request made to pose questions in advance by Twitter, and I had duly obliged. One of mine was the only one of these read out, and out of context to cover another point. Disappointing. Saturday was 'the big one': Talking Rubbish.. creating sustainable design'. Hosted by the University Professor of SD, Daniella Tilbury, it featured Architect Craig White, and Ed Douglas Miller of Remarkable fame. Well, while it jogged along as far as it went, it didn't go very far. A few rather 'loose' scary claims on climate to kick off, which I thought were unnecessary (not to mention of questionable accuracy) in light of the triple bottom line benefits of the actual concepts being pitched. I cannot see, for example, any issue with promoting the BaleHaus where practical as an option. I was also struck by a quote attributed to Prescott Alan: 'There is no country, place or people that can be sustainable'. There were not many opportunities for Q&As and exchanges, and on closing the panel went into a protective huddle. I had a few. One did get, sort of, answered. But there was a silly lady who was hot under collar that a reused pencil still produced shavings, which were wasted, missing that one more use is still a reuse and double the benefits. In fact, this propensity to huddle up with your mates and bale stage right meant I decided to forgo the evening keynote from John Hegarty. Somewhat of an iconic figure in the ad world, he had extra meaning as he once hosted a workshop that inspired young creatives like me. Then, years later, he hired an art director that I had discovered at a Singapore College and trained up at my agency. I am sure what he had to say was going to be, and indeed was awesome, but this really was not enough for me to wait several hours for to be talked at and then see him scoot out a side door and away. I donated my ticket (the most expensive of the weekend) to a needy student. Sunday was just one: 'From Garden Shed to Dragons' Den' by Mark Champkins, amongst other things Inventor In Residence at the Science Museum. This redeemed some of the disappointments a fair old way. He was funny, interesting, and hung back to chat. And a prodigious inventor taboot. Kicking off at college with 'self-heating crockery' he also opened a few eyes on 'Dragon's Den'. From some others I knew most of the horrors of TV ratings over actual discovery or reality, but he added a few further reasons why this is one show to keep a bargepole away unless it can be totally 'managed'. Which, given it is post-shoot edited, seems a near impossibility. He then got into process issues, with examples/tips, and this was both interesting and useful. And he made it very 'real' and personal, with great anecdotes. As one cursed with the monkey on my back of loving to create but ever aware of the imposition of new ways to add 'stuff' to the consumer stream, I was intrigued that Jamie Lee Curtis patented a disposable nappy concept, but mandated it not be marketed until proper disposal technology had been invented to deal with it. Would I go back? Hard to say. The value of these events.. to me at least... is in the interchanges and networking. The best part was the Friday evening, at an event post-festival by an RDA-sponsored local group where I met possible synergistic partners in design, eco, and music. Design is such a nebulous construct. There's what it was, what it is and concerns on what it might become. Less of a priority in some cases at this event was what it needed to be, good or compromised. 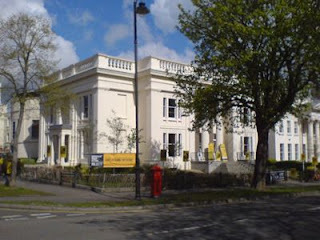 Too often, to cheers from the gallery, some speakers (whose designer spex went not to savers for a service) would chant some 'right on' populist slogan, and the assembled BMW drivership of that urban jungle that is the leafy boulevards of Cheltenham, or their iPhone-adorned progeny, would roar in approval. One speaker even made play of the 'new breed' of student who were only interested in 'doing good'. Nope... I recall this was pretty much the deal in the 70's too, Bub. And while I am a living example of that aspiration, those frames and SUVs do not get sustained from thin air. People have to 'buy' the design, in all senses of the word. Like my definition of an entrepreneur as a person with an idea that has actually sold, so design is but a doodle unless a market embraces it. Despite the intimate surroundings of even The Studio, one venue used beyond the very nice Theatre, the overall sense was to me more one of 'broadcast only'. Yes, after the pontification or pitch that was the lecture there was usually a Q&A, but these were tightly controlled and limited. Thing is, even if 'free', the investment in getting there and hanging around can carry a huge cost too. But like that ever-elusive seam of gold I dig towards, you won't strike it unless you are there swinging the pick. "All the reviews that are fit for printers"
However, it still serves to headline a nice story for today's blog. A wee while ago our two Epson C900 Lasers were starting to show their age. This age being back to them helping with the first Gutenburg Bible run, was considerable. Sadly, they were 'sort of' working. Even sadder, in the world of printers, 'sort of' doesn't quite cut it really. These days we barely print, but when we do, it's nice if the page looks 100%. That is where the nice folk at Cartridge World Hereford came in. Learning of my plight at a recent 'do', and with a branch in Ross-on-Wye, they kindly offered to see what they could do. Well, I am glad to say they have done a lot. Sadly not a full rescue, but in this case '2 into 1' did go. And now, with luck for a while, I again have at least one laser that is operating on the best from components salvaged from two. And really, after all this time, you really can't ask for more than that, can you? Had a good chat when it was dropped off, and the news for the future is less good. Seems build qualities are really heading downhill further, and even top brands are really only designed to last... 3 years. That... is a heck of a short built-in obsolescence period. Not to mention the cost of consumables. Still, a nice RE:pair story for the day, I am happy to say! 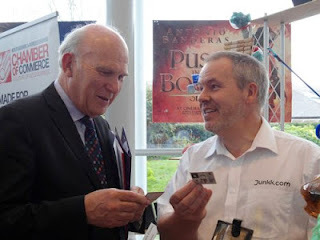 At the kind invitation of a small business support network locally, and having been encouraged by Dr. Vince Cable leads following an event here in Herefordshire recently, I have shared these thoughts as requested here. I hope the investment in time will be of value and pay off. Vast amounts are being invested in all sorts of support; we simply need to ensure this is not just on process to please the awarders, or money to please awardees initially, but in deriving long term end results that please all, and deliver end benefit to the country. "We would like to hear your views on these plans"
Mine are, of course, based only on personal, if not always great experience. However, we learn from mistakes, and if those I have experienced can help others then great. More selfishly, if a problem shared can see it reduced by collective experience and brainpower... even better. First a general comment. Appreciating designations and parameters are of course as necessary as they are inevitable, under SME there is of course, a world of difference between a 249 staffed 'M' vs. a lone 'S'. But that latter of course can just as easily be where the ideas that need protecting emanate. I'm not complaining, but it is a simple fact I merely ask be borne in mind by some who, perhaps enjoying experience more from larger enterprises, can forget that the person doing the looking and chasing and filing and researching may be the same one trying to create and sell and fill out the tax returns and week's end invoicing. And while any professional input on IP may equally be a phonecall away, it may not, as can be, in-house and free, but with a hefty hourly charge attached. This needs bearing in mind when asking for input on documents that can run to many pages. The small SME owner does not earn a salary or generate (immediate) income reading these, much as they can be helpful and warrant the investment. I was not aware, for instance, that we had in Baroness Wilcox a Minister for IP. One I may well be getting in touch with about special relationships with trading partners. I have, in my time, been lucky enough to enjoy many opportunities to learn more on the topic, and indeed benefit from the odd award (Fillip via our RDA a few years ago). On the whole these have been OK, but have tended to avoid, perhaps for fear of scaring folk off, the utter nightmare of the the long term costs simply on renewals, much less what happens in the case of a fight. Also, with some recent, bitter experience, the apparently well known pitfalls of government level hurdles in some markets have not been highlighted. * We are also considering further options to create new networks across the country to reach out to SMEs: first, working with the Local Enterprise Partnerships to offer tailored local advice to businesses in different regions and second stimulating the creation of business and IP advice networks across the UK. This was mentioned by Dr. Cable and would be a good step forward. Or... they do all by the book, and get screwed over by very dodgy national practices. 3. The cost of IP management. * In 2006, the Gowers Review estimated that, faced with an infringement claim, the cost of challenging a patent could be £750,000 even for a relatively straightforward case. A one man band with a great idea... how is that kind of money even worth getting into? This goes to the heart of ideals vs. realities, and routes folk get seduced down. Apologies, but much here is way too simplistic at practical levels. Is the intent vague box tickings on 'awareness' or helping resolve tangibles? The Masterclass may go towards solving this, but who gets it and at what cost is unclear. Dr. Cable mentioned the latter, and this is necessary and welcome. A core point was that few who are good at creating IP-worthy ideas may have the necessary skillsets alone to then develop and market them. A team is needed, and at least at government/NGO level, help in matchmaking complementing partners. This looks more promising. I note the funding, but concerns again are inspired by what gets you launched and then left. £3000 is the cost of appealing (so far, I know) a silly objection from the Patent Office in just one market. ...and, not in my experience. We are keen to hear from SMEs, their representative organisations and advisors operating in the IP space whether they feel that a directory of this sort would be helpful. ...couldn't hurt, but again is but the tip of what can become an iceberg. I am pretty confident I have by my efforts and helpful pointing from others (Coventry & Aston Unis) found the right and best in their fields, but as a one man band the costs, especially when advice can often carry 'on your own head caveats', can be prohibitive. One involving advice higher up the strategic ladder of IPO, and matchmaking with much more usefully complementing talents in exploitation. • Specialist help to commercialise innovation and to build a culture of innovation within the business...... Cost? Consultancy? Commission? Duration? • Access to business and knowledge networks. ... can be a huge time drain if not channeled, with dangers of 'little knowledge' on top. Things like this, and others http://www.bl.uk/bipc/dbandpubs/intpropres/index.html can be of value in complement (if sometimes, confusingly overlapping, if not competition), but the caution must be that folk are launched into a highly complex and hugely expensive money pit that often confronts one, too late, with some unenviable options having been seduced into investing in areas that are perhaps not the highest priority or indeed wisest. The IPO will work together with the Technology Strategy Board to develop an SME engagement pack. Of interest, if 'assisted' in engagement. These were mentioned by Dr. Cable and bases have been touched already. Again, reading the summary, I caution against 'fund and forget' box tickers, or any 'awareness' that seduces with basic knowledge into areas where much more, and worse, can lurk. capped price consultancy support to do so, potentially with a payment subsidy from the IPO. I have several more ideas in the pipeline. The cost and experiences in IP management to date has placed a curb on my enthusiasm. Such an offering may at least help, especially if introduced into a more supportive network, and with luck, motivated (by mutual reward) 'team'. The key is knowing where you stand and with some reliability, from start to a few years down the line. I am in a black hole without end in sight, that has blown all budgeting estimates into touch as unexpected costs and delays have appeared from nowhere. I'll repeat it again here: an entrepreneur is just an innovator whose idea has made a profit. And any fool can have a good idea. The trick is selling it. I am, currently, just a bloke who tinkers in his shed. No more; no less. That one idea has a global market value of billions and true green contributions is, currently, neither here nor there. Or that there are others on the prototype jig. My current view is that the costs and effort and delay I have ploughed into conducting (what may have been a flawed) IP strategy could have been better invested in getting to market first, biggest, best and with most noise. And risk the copycat notion of being first to be second being left in my wake. However, that is not always practical, for reasons of cost, scale, expertise, logistics, etc. Back to building the team. And to share the idea to create one, you need IP reassurance. Win-win... or lose-lose? No one wants to think of problems. But they do happen. Best to acknowledge, and allow for them. For future efforts, I like the idea of an opinion service, which I was not until now aware of, as it seems a useful interim before hitting the costs of professional IP lawyers. 2) Disputes with professionals hired to advise or help. Who can assist if dropped in a mess, or left to resolve one by a paid (or even funded) consultant, especially if having been seduced down a path from which there is now no easy exit or retrace? Now like I say, this is all based on personal experience. But views were asked for, and I have tried to offer them, perhaps with value from the perspective of the very small SME innovator who has hit hurdles. Some of these comments may be borne of ignorance or naivete. That... is the point. Folk who create out of thin air often are not blessed with more down to earth legal or business minds more suited to today's structured markets and administrative disciplines. In the course of the above, I added the links and sections below, with a view to addressing these also in this response. But looking at documents of almost 200 pages, I think that this is best left to a separate, future review and share on my part. Sighs of relief noted. If there is value to be gained (not sure my area of expertise in economics), I'll give it a shot. Our Universities, Research Councils and businesses are national assets that form the foundation of the UK’s future competitiveness. However, if we are to realise our vision for the UK’s future we need to strengthen our innovative capability and encourage further investment in innovation. The Government has already made clear its commitment to the UK knowledge base by maintaining the annual £4.6 billion budget for science and research programmes with £150 million each year supporting university-business interaction. Going further we intend to maximise the impact of our research base on economic growth and have committed an additional £495 million to Science Capital Investment projects since January 2011. The Government is improving incentives for companies to innovate especially SMEs. In addition to our successful changes to the SME R&D Tax Credit we will invest an additional £75 million to support small business innovation including additional funding for Smart, grants that support SME research and development. We will implement a new innovation voucher programme enabling small businesses to engage with universities and the wider knowledge base. We will invest more in the Small Business Research Initiative helping more small businesses to win government contracts for their innovative products and services. The Government is putting innovation and research at the heart of its growth agenda through greater investment and increased collaboration ensuring that the UK has a promising future. This is our Innovation and Research Strategy for Growth (PDF, 1.1 Mb) . Underpinning the BIS Innovation Strategy is an economic analysis that sets out the conceptual and empirical thinking behind the Strategy. It rests on three bodies of work and evidence: recent results from innovation economics, recent policy-related studies, and new innovation data. Both theory and evidence show that innovation is the central source of economic growth. But innovation is changing its scope and forms: across borders, across institutions, and in terms of its methods and processes. It is necessary to look at innovation as a system, in which different actors (universities, infrastructures, companies, and the public sector) collaborate directly and indirectly. Four primary policy challenges are identified: the need to facilitate knowledge flows, the need to maintain a high-grade knowledge infrastructure, the need to support business investment in conditions of uncertainty, and the need to build an innovating public sector. View the Economics paper: innovation and research strategy for growth (PDF, 2.4 Mb) . ensure coherence between the initiatives and investments being carried out in each of the Devolved Administrations with UK programmes and priorities, so as to maximise their reach and impact. I was about to hit the garden. So, thank you ReUseConnection... you have made my Sunday! And thank you nice ReUseConnection readers. As I am sure you will gather/have gathered, where they find and share great ideas, so does Junkk.com in complement, and for every good idea we can also offer the means to add the data to make sure it 'measures' up, literally. Fully searchable on the database across many parameters: dimensions, colours, materials... all you need to make it work and marry different bits of junk to make Junkk! Plus get inspired to see how designed-in reuse can be a great alternative between reduction and recycling (ps: we share repair too). Of course, now the real work begins. I am betting most who saw that, and may come to the site, are from the US. And while we have a slight 'fix' (popping in the HR9 postcode) to access the site in the UK, it is not ideal. Plans must be moved up the schedule. I have also noticed they have located RE:tie's own twitter account which a) I had forgotten about, b) haven't updated in an age and c) can't now recall the password to access. All jobs for next week. Maybe even a new newsletter is due, now we're again get Government and International community notice and support. I may yet attract the help I need to really get the site working as it should again... maybe even self-sustaining? A man can dream. For now... garden... well, after the BBC 'Be Your Own Boss' application, due by midnight tonight. But he and I thought it funny. The 'he' in question being Cabinet Business Secretary Dr. Vince Cable. HerefordshireGreenlinks & Chamber of Commerce hosted an event at The Courtyard yesterday, visited by MP Jesse Norman and also Business Secretary Dr. Vince Cable. Dr. Cable toured the Green Expo, and took great interest in the many environmental concepts and businesses being exhibited, being especially complimentary later in the Q&A session, held in a packed out theatre. Replying to a question regarding business support by Junkk.com’s CEO Peter Martin, having seen their ‘RE:tie’ reuse ‘packaging strip into cable tie’ concept, Dr. Cable referred to it with the comment: ‘Brilliant ideas, such as yours’. We are sure the concept’s Cable-tie reuse feature, and brilliance, were in no way associated in the canny politician’s mind when he said that! Says Junkk.com’s ‘Junkk Male’ CEO, Peter Martin, ‘The Secretary of State’s full remit is ‘Business, Innovation and Skills’. I think he has gained a great appreciation of how much the last two exist in Herefordshire, and in particular our little neck of the woods. As to ‘Business’, well, for us at least, two out of three is a very good start. I’m happy to note Dr. Cable’s positive shared thoughts on helping matchmaking complementary talents to create effective, sustainable, profitable environmental businesses to contribute to the growing UK green economy, at home and abroad’. The Q&A was quite lengthy, but worthwhile, with Dr. Cable, and Coalition Government policy, challenged on many topical issues and concerns. Dr. Cable replied at length, and in some cases offered reassurance, especially in areas of support for maybe less business-savvy innovators, particularly ‘green-related’ ones, referring to possible help on mentoring via BIS Local Innovation Centres and Local Enterprise partnerships: ‘supporting areas as much as things’. Ross-based Junkk.com is now no stranger to the House of Commons and its inhabitants, being presented there recently with a coveted 'Green Apple Award' for the RE:tie, adding to an already well stocked international collection for reuse ideas under the Junkk innovation and design banner. On balance, a good time was had by all. Now, if this doesn't lead to hooking up with some money making experts... what the heck will?